Britannia isn’t just the biggest ship ever built for the British market – she’s glamorous too combining the excitement of cruising with the sophistication of a five-star hotel. Enjoy classic European cuisine by Marco Pierre White, create your own culinary masterpieces with an all-new Cookery Club with James Martin and try our relaxed buffet dining around the clock. Whatever you fancy, Britannia serves up something for every taste. You’ll also find on board 4 pools, a Spa and Retreat, fantastic children’s clubs, theatre shows, films bars and nightclub plus much more. There really is something for everyone. Fully air-conditioned suites enjoy a separate bedroom with two lower beds convertible to king-size bed. Bathrooms boast a whirlpool bath, shower and WC plus luxurious premier pamper pack, bathrobe & slippers. Additionally there is a useful walk-in dressing area with trouser press and a hairdryer. Fully air-conditioned balcony cabins enjoy two lower beds convertible to king-size bed. Bathrooms boast a bath with shower or shower, sink, and WC. Additionally there is an iron & ironing board, trouser press and a hairdryer. There is a sitting area with sofa, chair and table, two flat screen interactive TVs, plus radio and telephone, writing desk, refrigerator and tea/coffee making facilities. There is also a safe. Floor to ceiling sliding glass doors lead to your balcony with recliner chairs and table. Balcony cabins have an atlas and binoculars, plus mineral water and luxurious pamper pack on arrival. 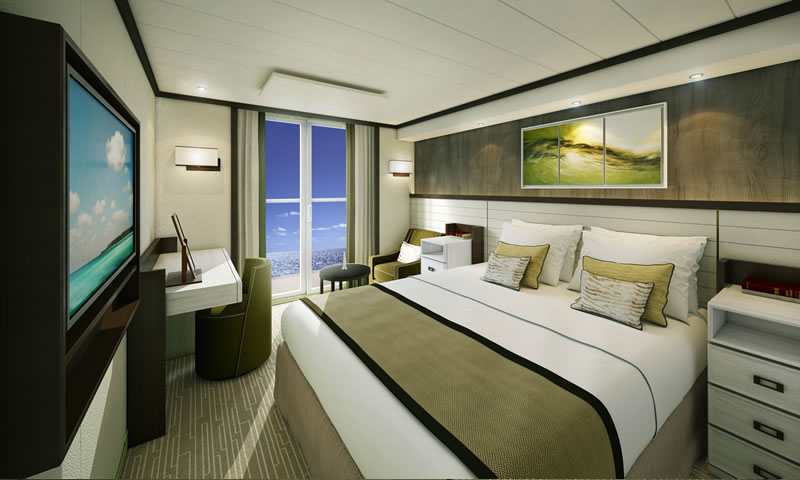 Fully air-conditioned balcony cabins enjoy two lower beds convertible to king-size bed. Bathrooms boast a bath with shower or shower, sink, and WC. There is a chair and table, a flat screen TV, plus radio and telephone, writing desk, refrigerator and tea/coffee making facilities. There is also a safe. Floor to ceiling sliding glass doors lead to your balcony with recliner chairs and table. Plus mineral water and pamper pack on arrival. Bathroom with shower over bath or shower only, WC and mirror.